Archbishop Patrick John Ryan – His Life and Times – Ireland – St Louis – Philadelphia (1831-1911) was launched on May 7th by His Grace, Most Rev.Dr Dermot Clifford, Archbishop of Cashel and Emly in the Bookworm book store, here in Liberty Square, Thurles. 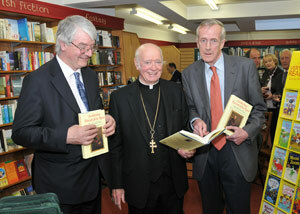 Our photo shows His Grace, Archbishop Dermot Clifford, with Dr Martin Mansergh T.D. who wrote a review of the book and the author, Patrick Ryan, the latter himself a native of Thurles. When Patrick John Ryan went to St Louis, Missouri, as a deacon in 1852, he was far better prepared for the life he chose to lead, than he could have imagined. Here in Ireland, where being a Roman Catholic was seen as a badge of exclusion, he saw how the economic and legal powers were wielded by the Protestant minority as a means of suppressing the Roman Catholic majority. He saw at first hand the concessions achieved through the actions of the Roman Catholic Church under the political leadership of Daniel O’Connell, ‘The Liberator’, (1775 – 1847), who now became his role model. He had benefited from a primary school system that developed along denominational lines and as a teenager he had witnessed the horrors of the Great Famine and the mass emigration which followed. All of these experiences were to become directly relevant to his life and his future endeavours in America. During his time in the United States as priest, bishop and archbishop, the Roman Catholic population quadrupled to more than fourteen million, primarily because of the influx of European immigrants. In addition to the problems encountered as an administrator and as a shepherd to his flock, he also had to contend with the attendant hostility, prejudice and discrimination. Through the power of his intellect, his extreme warmth and his quick wit, he not only succeeded in meeting these challenges head on, but played a major role in improving Church-State and inter-church relations. He took a leadership role in supporting Native Americans and African Americans and earned an international reputation as a powerful preacher and orator. It is likely that even if he had chosen a different career path in life, he would still have merited a biography. Patrick Ryan was born in Thurles, County Tipperary and now lives in Dublin. He had a very successful career in banking during which he held a number of posts at executive level, including that of Chief Executive of a company providing consulting services to banks in Central and Eastern Europe and the former Soviet Union. Following his retirement in 1999, he studied history and creative writing at University College, Dublin. His grandfather, Hugh Ryan, was a cousin and contemporary of Archbishop Ryan. While researching the life of the Archbishop in compiling his own family tree, he felt compelled to ensure that his story would be told and his achievements acclaimed through this biography. This new book makes for compelling and highly recommended reading, for those of you who wish to further understand the life and times of Archbishop Patrick John Ryan, in a local and a global setting.